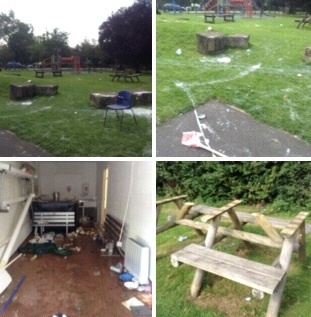 Police and Council officials have removed Travellers from Chadwick End playing field this afternoon – but look at the damage and mess they have left behind! Seventeen caravans arrived on Sunday (7th) and a further ten last night, they set up camp near to the children’s playground and also gained entry to the football pavilion. Police have been patrolling the area each evening and a local resident told us they really appreciated the support of the Police and Council – and felt safe knowing Police were on patrol in the neighbourhood. Twenty seven caravans have now left Chadwick End following an eviction by Police and Council officials. People are now saying the same Travellers have set up camp in Tudor Grange Park – this has not been confirmed.